Too often a gap occurs between formulating and executing strategy. In a disrupted environment this can be a fatal error driving unwanted costs, lost opportunities and, ultimately, failure to execute. And when failure at execution occurs, the losses are significant regardless of sector. This is unacceptable. To help you from making the same mistakes, here are four fundamental principles which underpin our point of view on mitigating the gap between formulating strategy and executing strategy in a disrupted environment. In exploration of an alternative future, a customer centric, innovative or empowering strategy must be tested and retested as execution takes place. If leaders and managers are prepared to explore a range of plausible realities, then deciding where and how they must focus their efforts in each alternative future (i.e. scenario) informed decision making is possible. 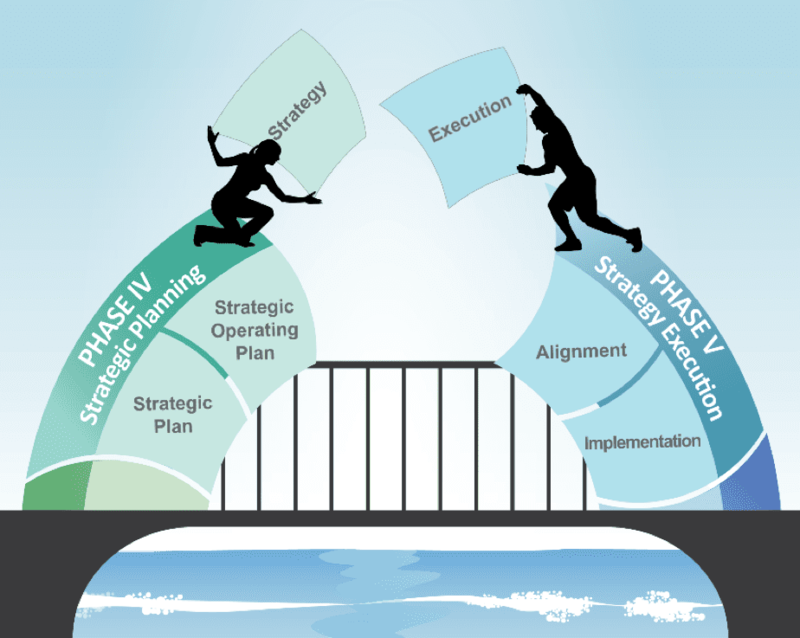 The level of enhanced strategic thinking during a well-constructed scenario planning process is vital to test assumptions to overcome disruption and lay the groundwork for effective execution. We include in our “test and retest” point of view two other fundamentals. First, to help manage risk, preparation of a portfolio of strategic options or “small bets” to advance, prioritize and execute is recommended. And second, focus on a small portfolio of strategic initiatives with dedicated resources from the beginning so the organization can move forward, learn and adapt quickly. A metaphor is a distinct figure of speech that describes an object or action in a way that isn’t factually true but helps explain an idea or make a comparison. In this case, I use the metaphor “two sides of the same coin” to describe the relationship between leadership and management when it comes to executing an organization’s strategy. Both sets of roles and responsibilities must be fulfilled before execution can occur. Antonio Nieto-Rodriguez, Past Chair of PMI predicts that, “By 2025, CEOs, senior leaders and managers will spend at least 60% of their time selecting, prioritizing and leading the execution of projects; as opposed to the 10% they spend today on average.” Leaders must communicate the strategy and its initiative to the team, inspire and motivate them to act, continually monitor events in the operating environment, point the team forward and transparently support the execution as their top priority. Managers must take the lead, both in responsibility and accountability, for implementing initiatives and actions that flow from the strategy to ensure strategic learning is taking place throughout the organization to guide the execution journey. For this symbiotic relationship to flourish, leaders must be open to learning and adopting proven execution practices. Unfortunately, too often leaders don’t understand and/or appreciate the vital role they play in the day-to-day to ensure execution can occur. The Project Management Institute points out that the “number one success factor” in strategy execution is an engaged executive sponsorship. On the other side of the coin, managers (at all levels) must learn and apply proven strategy management practices which grow their understanding of the strategy, including its rationale, assumptions, benefits, risks and intended outcomes. It’s been said communication is the currency of success. Ain’t it the truth! How often have you heard? After 33 years in this business I can tell you it is the most frequently raised weakness we hear by an order of magnitude. However, when “active listening” occurs and strategic assumptions are understood by everyone on the team, mid-level managers become inspired. When mid-level managers are inspired, workforce engagement grows. In turn, people put aside biases and look beyond siloed concerns to maintain focus on the big picture. When silos fall, people do what leaders want done because they want to do it. To make this point once is worthless and to make it one hundred times will be insufficient. Real multi-stakeholder communications require purpose, leadership and mid-level management commitment and, wait for it, repetition. Make transparent stakeholder communications a core value if you seek execution excellence. Intelligence Quotient (IQ) has long been considered a determinant of an individual’s mental ability. However, most innovations are by-products of incremental, collaborative progress built upon shared awareness rather than individual intelligence. That’s why collaboration in organizations is key. We depend on one another at every stage of execution to be successful as we face disruption and change. Collaboration is required when it comes to aligning the organization’s strategy with talent management and human resource management functions. Collaboration is vital when leaders and managers seek to align the organization’s IT strategy with the business strategy to drive competitive advantage. And collaboration is a must when we seek better integration strategy, project management, risk management and research functions within the organization. In closing, the principles of hypothesis testing, acting as one, active listening, transparent communications and scaled collaboration are solid fundamentals any organization can adopt and practice to ensure strategy does not fail at execution. Randall Rollinson is President of LBL Strategies. He is a certified strategic management professional. His core strengths are listening, facilitation and teaching. He has been a national leader in the development of the Association for Strategic Planning’s professional certification program. He has designed and developed a wide range of strategy management education and training program. His body of work includes the Mastering Strategy: Strategic Management Performance System Program, which won the 2001 Exemplar Award from the International Association for Continuing Education and Training, as an “exemplary, outstanding results-oriented program.” This online / onsite education program is now offered in partnership with George Washington University – Center for Excellence in Public Leadership. He can be reached at 773-758-6921 or at [email protected].